Are you thinking about purchasing a piano, and trying to decide whether an acoustic or digital instrument is right for you? For many people, a Roland digital piano offers so many practical advantages over an acoustic piano that it’s easily the best choice. With Roland’s SuperNATURAL Piano sound engine and sophisticated keyboard action, the digital piano now has the ability to mimic the sound and feel of an acoustic piano like never before. Thanks to these innovative new technologies, the same expressive nuances and complex tone colors that can be achieved on a high-quality acoustic piano are now available in a digital instrument. One of the biggest advantages of Roland’s SuperNATURAL Piano technology is the combination of sophisticated multi-sampling, sound modeling, and behavior modeling. This achieves a level of realism that’s simply not found in other digital pianos, providing not only superior sound, but also superior touch that responds in a natural and organic way to the subtlest nuances in your playing. Roland’s SuperNATURAL technology accurately emulates the complex tonal behaviors of the world’s finest acoustic pianos. Sampling is, in simple terms, a digital recording. Roland meticulously records top acoustic pianos, capturing every key at many different velocity levels to accurately reproduce its tone color and sound. Sound and behavior modeling is an additional step that Roland takes to ensure an organic piano sound. These advanced technologies consider and mimic every aspect of tone production that goes into the final sound that reaches the ear. Included is the design of the acoustic instrument, the materials used in its construction, and the sound space of the room where the instrument is played. Most importantly, the modeling technologies reproduce the subtle tonal changes that occur with different dynamics and playing styles, putting an extremely high level of expression under your fingers. To harness the power of the SuperNATURAL Piano sound engine, Roland has developed keyboards that feel and respond just like the 88 weighted-action keys on an acoustic grand. Unlike simple spring-action designs found in many digital pianos, Roland uses an actual hammer-action design for a truly authentic touch. The attention to detail even includes the feel of the keys themselves, with special materials used that mimic the feel of real ivory and ebony. The PHA-4 Concert Keyboard with Escapement and Ebony/Ivory Feel provides the authentic touch of a real acoustic grand. Beyond the technical details, Roland’s ultimate goal is to blur the line between the acoustic and digital worlds, giving players high-quality instruments that sound great, feel great, and provide solid foundations for both learning and performing. When you play a Roland, you don’t think about acoustic or digital—you only think piano. Isn’t that the way it should be? 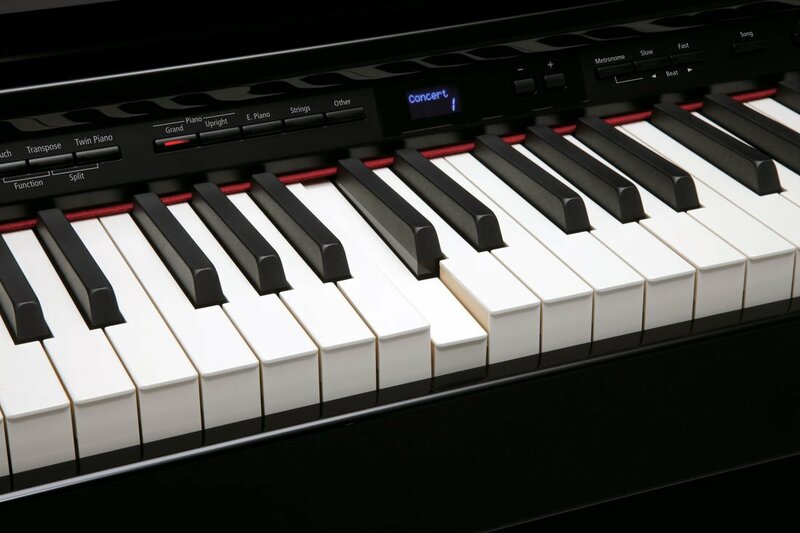 A Roland digital piano can be purchased for much less than a brand-new acoustic piano. The lower purchase cost means you can more easily invest in lessons for additional family members! Unlike an acoustic piano, there’s no need to tune a Roland piano—it’s always perfectly in tune, every time you play it. Because of the digital sound engine, temperature, humidity, and sunlight present no problems to the tuning stability. On the other hand, acoustic pianos require regular tuning and other mechanical maintenance from a technician to sound their best. The maintenance-free aspect of a digital piano can easily save you thousands of dollars over the life of the instrument. In addition, digital pianos are easy to clean, thanks to synthetic materials used for the keys and body. These materials also offer great durability, a great benefit when kids are learning on the piano. The ability to plug headphones into the digital piano and practice silently is beneficial to both the player and everyone else around. Piano students can practice anytime they want without worrying about bothering roommates or family. It can also make the student more comfortable to make mistakes while practicing, as no one else can listen if the player doesn’t want them to. Playing with headphones allows you to enjoy the piano at any time without disturbing others. Digital pianos are more compact and weigh far less than an average acoustic piano, making moving and transporting the instrument very easy. Some Roland pianos are light enough to move easily from room to room, and many are compact enough to use for performing outside the home. Learning to play in time, without skipping or adding beats, is an essential skill for every musician. All Roland pianos feature a built-in metronome that makes it easy and convenient to practice to a steady beat. You can select from a variety of different meters, which makes learning about mixed meters easier. Some models even allow you to select a counting style other than a simple “click” sound. For example, you can have the piano count out numbers, syllables, or even dog barks and cat meows! This makes playing to a steady beat more interesting, especially for young students. Available on many Roland instruments is the Twin Piano feature, which turns your 88-key piano into two independent 44-key pianos. Both of these “mini” pianos have their own middle C and sustain pedal, allowing two people to pay side-by-side in the same ranges. Each side also has its own headphone jack, which lets two students practice at the same time on one instrument! 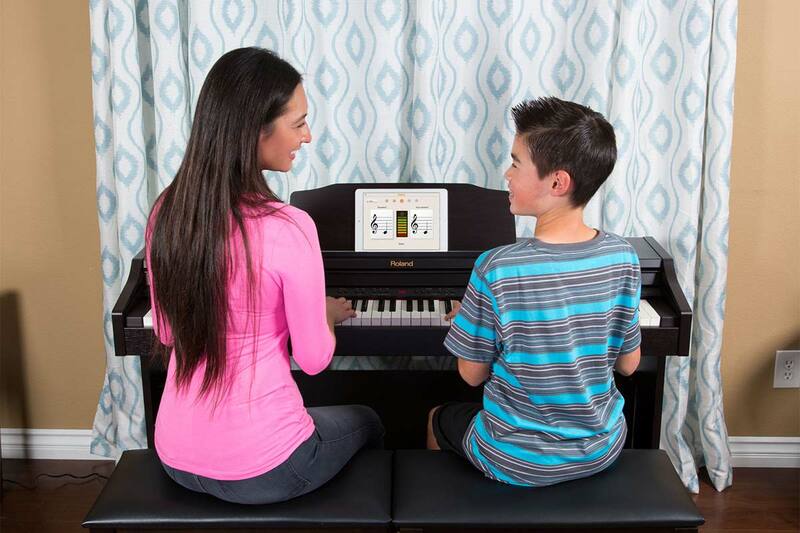 Twin Piano mode allows two people to play side-by-side in the same ranges, a great feature for teaching and practice. 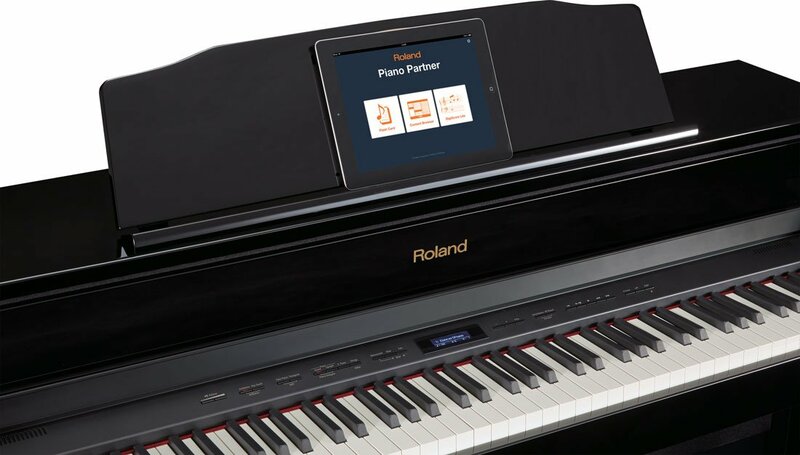 Various Roland pianos include unique digital features to enhance learning and make playing more fun. Additional sounds beyond the piano encourage creativity and practicing. For example, a student can play their Bach invention with the sound of a harpsichord, or their jazz prelude on some cool vibes. With sounds such as strings, brass, organs, guitars, drums, and many others, there are endless possibilities for exploration. Many Roland pianos come with a large onboard song library that includes piano classics, exercises, and popular études like Czerny 100 and Hanon. These are great to help guide students as they learn to play. Built-in rhythm accompaniments provide a full-band sound that automatically follows chords played on the keyboard. In addition to being a lot of fun, this introduces beginning students to the feel of playing with other musicians. A growing number of instruments support Roland’s free piano apps for Apple iOS mobile devices, offering a great way to enhance the learning experience and motivate kids to play. The Air Performer app lets users play along with favorite songs in the iPhone, iPad, or iPod touch wirelessly through the piano’s sound system. Piano Partner for iPad includes interactive musical games that are fun for kids, a graphical interface for selecting tones, songs, and rhythms in the piano, and a notation feature that shows a compatible piano’s built-in songs as sheet music on the iPad. Roland’s free Piano Partner app for iPad. Roland digital pianos also offer built-in recording features that make it simple to capture performances. Students can record their practice sessions and listen back for self-evaluation, tracking their progress and hearing areas that need improvement. Teachers can also record exercises into the piano, a convenient way to provide weekly practice material for their students. Some models have a USB port, which allows for easy sharing of music files. After students have recorded their playing, they can transfer those music files to a USB stick and share them with friends and family via their computer! The possibilities available with Roland pianos extend even further than what we’ve detailed here. For example, the innovative HPi series features a large display built into the music rest, providing digital sheet music and interactive games that make learning fun for all ages. Roland instruments also offer USB and MIDI connectivity, making it simple to use the piano with popular music software on Mac and Windows computers. To find the Roland piano that’s right you, explore the entire lineup with the model selector at MyFirstRolandPiano.com.